The visit to the apiary today left one feeling pleased and sad at the same time. The next visit is not going to be for two weeks and with this extended cold patch the idea was to ensure all the colonies have enough stores to see them through to mid March no matter what. To this end a 2 kg bag of sugar was cut and submersed in water for 5 seconds then placed upon the crown board of the hive within a super box (acting as an eke). The final colony was the pleasure (although we are not out of the woods yet). 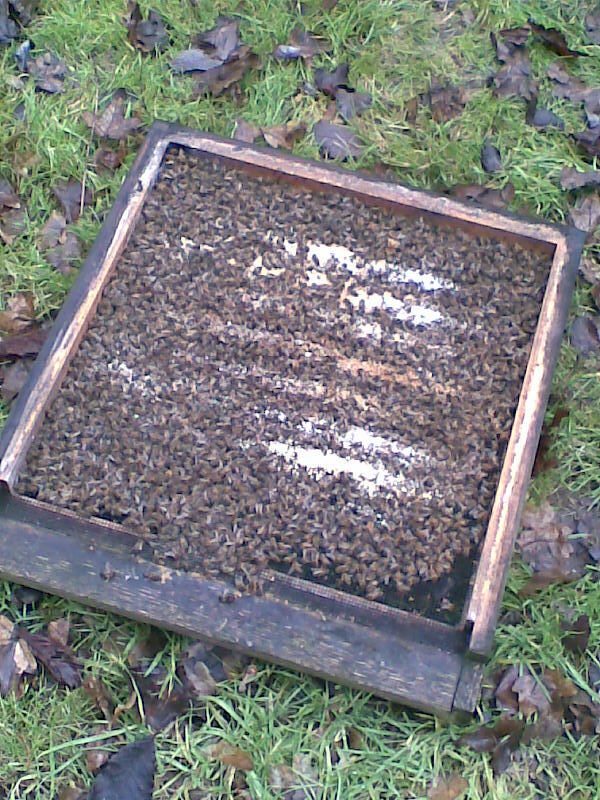 Firstly there were a lot of dead bees behind the mouse guard so the floor was replaced, the picture shows the carnage on the old floor but at the same time it gives encouragement by showing the bees are working 7 frames (see the lines of wax deposits). This colony is sick and has been a concern all winter but is surviving, it has been fed and if it survives to March we will try a Bailey comb change. The sun was out again today, although the air temperature remained around 7 degrees, this was enough to bring out the bees. They were out from 4 of the 5 hives in the Apiary, if the weather stays fair for the weekend we will need to check inside the remaining hive as there have been no bees out from it since Christmas..
Hefting all the hives indicated there are still stores. Two hives were sharing a stand, these have now been split onto two separate ones. Moving hives around the apiary is far easier in winter when the bees have been shut up during a period of cold, the 3 ft rule does not have to apply. 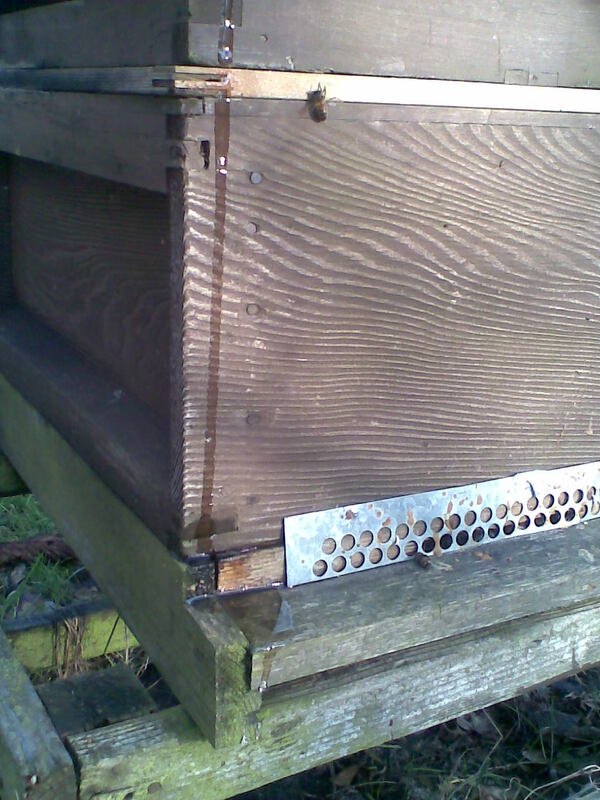 One of the hives still had a Contact feeder with sugar syrup within it, it looks like the warm sun had caused the lid seal to rupture resulting in a sugar syrup stream down the front of the hive, see picture. In the season one would need to immediately wash this away in order not to attract robbing bees. However as it is winter and also there is no water source at the apiary the cleaning down will have to wait for the weekend. The weather is still poor, but at least it is not snowing. The air Temperature is oscillating between 3 and 5 degrees but with the wind chill it feels a lot colder. This week there is no photo as there is nothing really going on, it is like the twilight zone Winter has been here long enough but Spring is not quite ready to arrive. 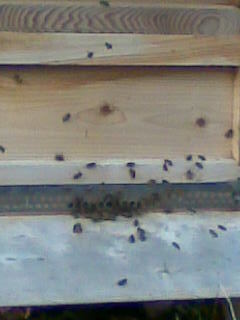 All the hives were hefted and although obviously lighter not dangerously so. Last week it was noted that hive 9 and 10 did not fly so a quick look inside Hive 10 was thought to be in order. Thankfully the cluster is alive and well, in fact it has not consumed the fondant put in over the Christmas period. At the Association Committee meeting earlier in the week there was a debate on bottom and top bee space hives, the standard at the Apiary is bottom bee space. Surprisingly we have a large number of top bee space boxes in the hut which can cause confusion, they have now been given their own area and are soon to be clearly marked. The first signs of spring are all around us today, temperatures of 10 degrees, snowdrops in flower and the aconites popping up with their yellow heads. In my own apiary the bees from the strong colonies were out in force, as can be seen in today’s image. At the association apiary the bees were flying from 3 of the 5 hives, although not quite as strongly since the site is more in the shade at this time of the year. The fact the weaker colonies did not have bees flying today should not be a great concern as the temperature was still on the cool side. The forecast is for warmer settled weather over the next few days, a good time for the bees to take their evacuation flights and a reminder that the start of the season is drawing near. Best start preparing for the season as it is definitely going to be a busy one at the association apiary as we have all our courses already fully subscribed. You are currently browsing the Mid Bucks Beekeepers Association Blog blog archives for February, 2010.